Well, actually, as you know, hermit crabs don’t just ditch shells willy-nilly; instead, they move carefully once they outgrow their old one. And thusly Eremita presses in a firm but calculating way on the boundaries already established on its predecessor After (yes, its predecessor, After) rather than discarding them. 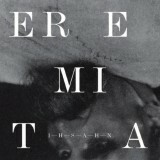 One thing that is striking and unexpected here is a seemingly reinvigorated interest in reincorporating the sound of earlier Emperor albums into the swirl that is contemporary Ihsahn’s influences. Look at Grief- a synth string interlude that would fit very easily as a rudimentary tension-builder on In the Nightside Eclipse. Then there are moments like Something Out There, where we get an Anthems-like tirade of blastbeats accentuated by those strings again. This being Ihsahn circa 2012, that’s clearly not all there is to it. Neatly harmonised melodic choruses which interweave cleverly with the strained rasps and a tightly worked lead solo mean that you are wrong-footed by the intelligence of the songwriting (though I’m not sure of the wisdom of lyrics that go “Something, something, something, something”- it sounds like you’ve forgotten the words). And that theme of being wrong-footed by tricksy songwriting is apt for much of the record. The first couple of tracks actually initially hint at a fiendishly clever but still fairly familiar prog-metal album comparable to someone like Opeth. I appreciate that’s a referenced that is hurled indiscriminately at any poor sod that has a bit of a loud-soft dynamic, but listen to the cunning interlocking of chromatic metal riffing sprouting out of acoustic shadows, anthemic vocal hooks, and off-kilter instrumental turnarounds on, say, The Paranoid, and try to deny the likeness to Still Life. Opener The Arrival is similar, with flashes of organ suggesting (but never following up) a retro sensibility. But, all of this said, the real distinguishing features of this album are very similar to those on After. Munkeby’s saxophone input is used in a very similar way, and the most obviously inventive and exciting moments on the album are where he is either screaming like a rusty gate being frantically waggled, or stretching out over the darker, quieter numbers. The Eagle and the Snake, in particular, is an impressively freakish album centrepiece. It starts with horn-tinged fart-riffing, like a mockery of a swing band, before diverting into some intricate and enigmatic melodic lines, over the course of its eight minutes leaving ample space for widdly prog lead guitar soloing to take turns with Munkeby in the limelight. One of the highlights of the album is when a very strange, languid riff that emerges three minutes in bleeds with militaristic drumming, and the reeds screeching over the top. A twisted, leering sound, balanced with eerie melody. Superb. So, where was I? Oh yes, crabs. No hang on, not crabs-Ihsahn. I’d characterise this is largely a follow-on from After, but with a more aggressive sound, which feels more confident both in branching out and reaching back to its youth- if you’ll pardon the mixed metaphor. That means, obviously, that it is pretty good, and a complete no-brainer for today’s forward-thinking metalhead.